CERN’s Large Hadron Collider beneath Geneva, Switzerland isn’t just one, but a handful of experiments sprinkled along the length of the 17-mile-round ring. 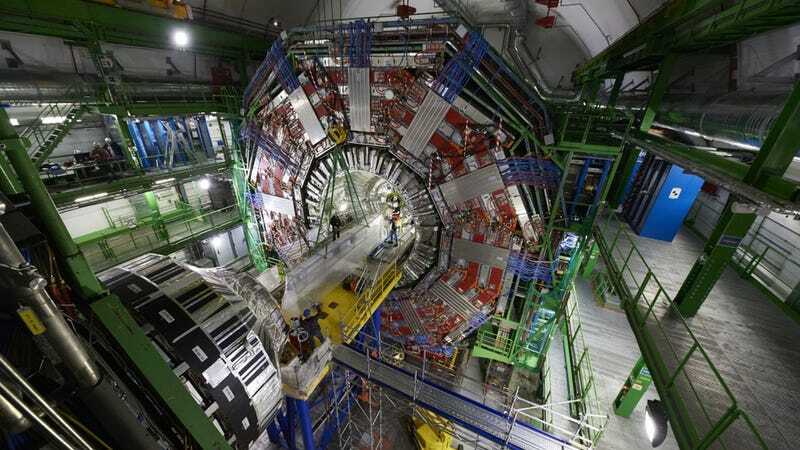 One of the biggest, the Compact Muon Solenoid or CMS, is getting a major upgrade today, which CERN is comparing to an open-heart surgery. The upgrade will swap out CMS’ innermost of several different particle detectors. The new so-called pixel detector will help physicists gather important information on potentially novel particles, like those predicted by supersymmetry, from the hundreds of millions of particle collisions happening every second in the LHC. The LHC itself recently received a major upgrade, boosting its operating energy from 8 to 13 tera-electron volts, which will allow physicists to gather even more data. The LHC is simply two parallel tubes with particles traveling in opposite directions around either. The tubes intersect at various points around the ring. Giant detectors, like CMS, wrap around the intersection points to observe what comes out of the collisions. CMS, by the way, is enormous. It’s 66 feet long and 50 feet in diameter—as tall as a four-story apartment building and as long as a pair of school buses—and it’s about 300 feet underground. The CMS’ pixel detector is basically just a 124 megapixel camera made from four stacked layers of silicon. When protons collide in the LHC ring, they send a barrage of particles outwards through the cylinder, which leave leaves a signal in each layer of the camera. Reconstructing the path each particle took means connecting those blips in each layer. The upgrade will allow CMS to pick out data on 50 to 60 proton collisions from two pulses of colliding particles, increasing the resolution over the 25 to 30 collisions from the old, 66-megapixel detector, said Ball. Those packets of particles collide every handful of nanoseconds, so the camera must be able to take around 40 million pictures per second. In the end, all of that data will be analyzed and graphed by physicists and compared to theoretical predictions and models see if any new particles, or other interesting phenomena, appear. You can watch technicians replace the pipe beginning today at 11:30AM EST here, and hear questions physicists have answered on a Facebook Live about the detector here.